Labor Day weekend: What happened to the rest of summer? Labor Day used to signal the end of summer, then school started. But our son and his classmates have been in school for weeks, and we’re hunkered down at work, focused on fall. 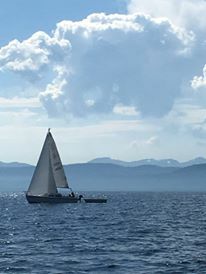 Our friend Dennis Barry and his wife borrowed our sailboat a few weeks ago to circumnavigate Lake Tahoe with some other locals of the Gold Country Yacht Club at Scott’s Flat, while we were getting our son off to school. Dennis is one of the original founders of SYRCL before it gained “wild & scenic” status for the Yuba River in the late ’90s, and he’s a big sailing enthusiast. Our interest in major-league baseball is waning, thanks to the San Francisco Giants’ losing season, but we’ll watch some baseball — and football — together on a cool, new “ultra-HD” TV I got to replace the old tube television we had. I kept it for sentimental sake; we had it for 15 years. Next week, we’re excited to attend “In Conversation with Alice Waters” at The Center for the Arts in Grass Valley. Waters founded Berkeley’s famed Chez Panisse restaurant, and will join the restaurant’s former “forager,” Alan Tangren of Tess’ cooking school, in a food and wine tasting. Beth Ruyak of Capital Public Radio will moderate Waters’ “conversation.” InConcert Sierra’s season also kicks off this month, with Artistic Director Ken Hardin conducting a full orchestra for the fifth straight year. I hope you have a happy Labor Day weekend, celebrating with friends and family. Hey, Jeff…Dennis was my contractor on the VERY LAST house he built before he retired to a life of “leisure” (ha, ha! he says he’s busier now than ever…especially now that Susie’s retired too! )…I’ve asked him if it was the experience of building my house that convinced him he needed to retire! (lol) What an incredible builder and terrific guy!